This class is suitable for those who have never learnt Spanish before. We'll be starting with 1,2,3, a,b,c, but the methodology we follow means that you'll be speaking before you know it! Perhaps you studied Spanish a long time ago and think you have forgotten it all! Don't worry, it will soon come back! This course loosely follows the level of a GCSE. 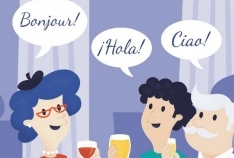 If you are starting to feel more independent but would like to get more fluent, come and join us! We'll be mastering the past and future tenses. Come to extend your vocabulary and polish your conversational fluency! Social Event in Cheltenham & Gloucester	Social Event and Taster Lesson coming soon! I’m a self confessed Spanish language enthusiast and I’m on a mission to bring language learning to the people of Gloucestershire! I think learning a language is the best way of really understanding a different culture, making new friends around the world and breaking down barriers. Whilst living and working in Spain, I found that being able to speak Spanish enabled me to connect with people and experience the culture on a deeper level and I have developed some really great friendships and lived experiences that I will never forget! I have always loved language in general and really enjoyed teaching English in Spain; both El Puerto de Santa María(Cádiz) and Madrid. I have been told that my classes always have a relaxed, comfortable atmosphere, something I am really proud of! I learnt loads from my students and we had great fun, too! Having learnt a foreign language from scratch as an adult, I have tried nearly every method going (and probably made every mistake going, too!). I have loads of great tips for avoiding putting your foot in it in Spanish, most from experience! I was attracted to teaching with the Language for Fun method, because there are so few group classes that prioritise speaking, listening and real communication, but also because learning is always more effective when you are relaxed and having Fun! Group classes create ready-made opportunities for communication and also motivation! Sticking with it is so much easier when you have others to share the journey with! I would love to be able to pass on my enthusiasm for the Spanish language and culture and create a county of bilinguals! I believe anyone can learn a language if you have the motivation and opportunity to practice! Hello! ¡Hola! My name is Marta. Nice to meet you! I am a native speaker of Spanish and a teacher by profession. I am originally from Barcelona, but I have just moved to Cheltenham, so I am looking forward to meeting new people in the area. I came with the idea of sharing a bit of my culture and language with those who may be interested or those who are just curious about it. Would you like to try? I hold a degree in English Philology and a Master's degree in Teacher Training for Secondary Education and Vocational Education, which enabled me to work as an English teacher in my home town. My professional experience includes working at a language school with students of different ages, at Barcelona University as an associate Professor of English, as well as teaching English privately for many years. Moreover, I have just finished my training course in teaching Spanish as a foreign Language, so I am willing to put in practice everything that I learnt! As you can see, I love languages and I love teaching - that is why there is always a smile on my face when I am in class! What else can I say about me as a teacher? I would say I am quite creative, organized, patient and understanding, but don't wait any longer, come and see for yourself! I'm looking forward to showing you all the secrets of the Spanish language and culture in an informal and relaxed environament where we can all enjoy ourselves. Welcome to Spanish for Fun!